Today we head back to March of 1976. In what is a first for me, and for O&W, a variant set of rules are presented for Diplomacy. It covers the entire first page. (Click over there for larger). The Editorial deals with the falling value of the Pound vs. the American Dollar and the effect it will have on buying some games from the US. Bottom line here is that GW will try to stock more D&D so people can buy it without having to pay for the shipping. I became very interested in American and British economies in the 80s. There was always "perception" that the recession in Great Britain was Thatcher's fault. But this points to the seeds of that time starting right here. Page 3 has something of a milestone of several sorts. First it is the introduction of Don Turnbull as a new fan of the D&D game. Also covered is the first set up of what would later be know as Play By Mail games. 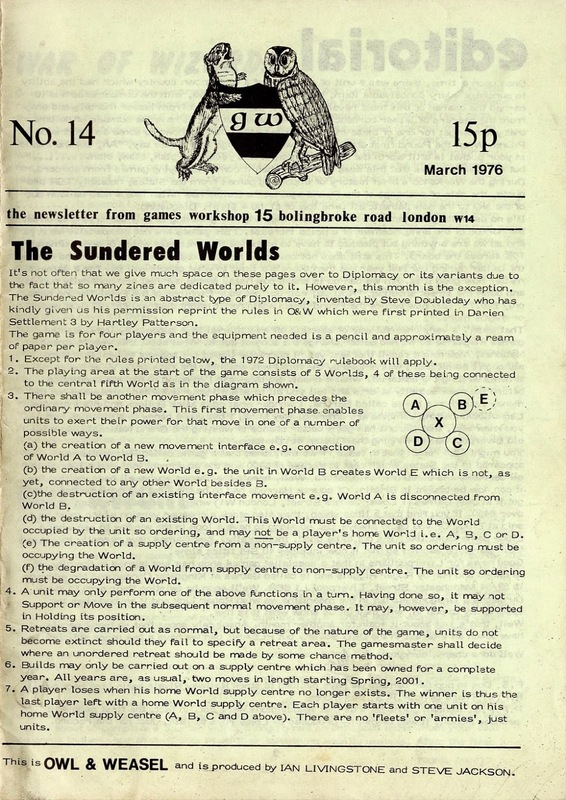 Page 5 is the first article of the D&D Society News. Several people send in their addresses, but no phone numbers. Ian Livingstone plays to make this a regular feature. Four longer reviews follow, one for "Feds 'N' Heads", "Bust", a railway game "1869" and "Fast Carriers". It seems that the reviews are picking up some now. I hope this is a trend that continues since it was one of my favorite parts of White Dwarf. We end with the usual batch of games for sale from "T.S.R." Could it be that the "D&D High" at O&W is over and they are getting back to board games? Maybe, but history teaches us something different.